Up until the last five years or so, Idaho wasn't really on the map in the golfing world. The 43rd state to join the union has made bleeps on radar with Sun Valley and the floating green at Coeur d'Alene Resort, but it's the recent additions of Black Rock , Circling Raven, and Osprey Meadows at Tamarack that have really started turning heads towards Idaho as a major golf destination. While for the local golfer it is fantastic to have so many affordable courses throughout the state, it takes something special to attract national recognition in the golf course world. To accomplish this goal usually requires a special piece of property, a big name course designer, and a the size of budget guys like Donald Trump and Bill Gates enjoy; something Idaho was seriously devoid of. Well that has all changed as the world's biggest name golf architect has now made his mark in the Gem State. Tom Fazio comes to Idaho with an unmatched r�sum� in modern golf course architecture. With 14 original designs on Golf Digest's Top 100 Courses in America list, he lays claim to the greatest number of courses by any architect on the list. Not only that, he has been involved with redesigns at several other top 100 courses; namely Augusta National, Oakmont, Winged Foot West, Merion, Butler National, and Riviera. In addition, Golf Digest has awarded Mr. Fazio with their "Best Modern Day Golf Course Architect" designation and he also received the Old Tom Morris Award from the Golf Course Superintendents Association of America; only the second course architect to do so. No living architect can compete with Fazio's r�sum� and golf course developers are waiting in line to pay his seven figure fee in order to have the modern day master leave his touch on their property. To get Tom to work on your golf course will take more than just a simple phone call and waiving money in his face. He has so many potential clients at his fingertips that you almost have to have an "in" to get Mr. Fazio out to your property. Well, that "in" is exactly what Idaho had in order to attract Fazio to our beautiful state to design Idaho's newest golf courses. 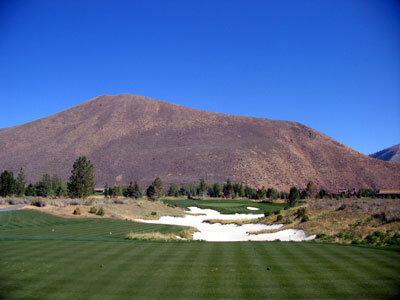 The first course is the new 9 hole track at The Valley Club near Sun Valley that was added to compliment the original 18 hole course that Hale Irwin designed in 1996. The second is Gozzer Ranch located above the eastern shores of stunning Lake Coeur d'Alene near Harrison. The "in" that The Valley Club exercised to land Mr. Fazio's services was none other than long-time friend Steve Wynn. Wynn is a member at The Valley Club and resident of Ketchum. He became very wealthy through the development of many high-end Las Vegas Strip casinos including The Mirage, Bellagio, and The Wynn among others. He became famous in the golf world when he teamed up with Fazio to create the greatest marvel in golf course history by creating a desert oasis also known as the Shadow Creek Golf Club just north of Las Vegas. The flat piece of ground was transformed into a world class course thanks to modern day equipment that allowed Wynn to move more than three million cubic yards of dirt, plant over 21,000 trees, import exotic birds, and create waterfall features that even Hawaii is jealous of. The course reportedly cost $60 million to create. 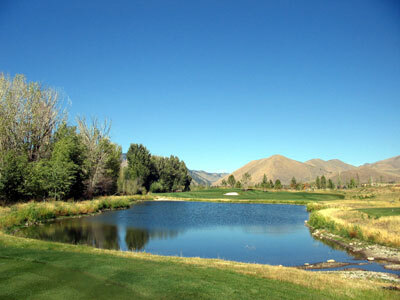 Fortunately for The Valley Club, it didn't require anywhere near as much money to develop thanks to the beautiful natural surroundings found in the heart of Idaho. Fazio generally would never be willing to take on a 9-hole project, but with Wynn's encouragement and the promise of designing an additional nine holes along with the possibility of redesigning the original 18 holes at the club was enough to entice him. In fact, the membership recently voted and approved the development of the second nine holes to accompany Fazio's work that was completed last year. The par threes at The Valley Club are particularly signature and diverse. The 4th hole plays 211 yards and requires a long forced carry over a pond to find the putting surface while avoiding the stream on the left and bunker on the right. The Pioneer Mountains stand as the background to the 150 yard 7th hole that features a massive sprawling bunker that runs from tee to green and brings both fear and beauty to the hole. If the second nine holes is as good as the recently completed nine holes, the members at The Valley Club will be thrilled for years to come. Gozzer Ranch's "in" to acquire Mr. Fazio's services is a long standing relationship between Michael Meldman and Tom. Meldman is the President and CEO of Discovery Land Company which developed the Gozzer Ranch property and golf course. Discovery Land opened in the 1990s and had Fazio design its first project, The Estancia Club, near the company's headquarters in Scottsdale, AZ. Since then Fazio has acted as the architect for nearly all of the company's 12 golf courses. The success of each course has been fantastic but Gozzer Ranch may be the crown jewel of them all. 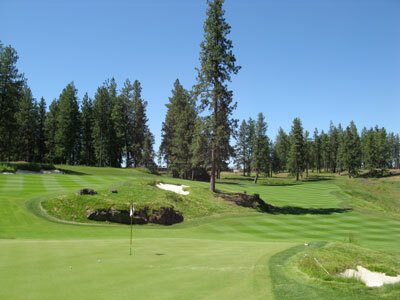 The course flows seamlessly through the pine trees and giant basalt rock formations looming above Lake Coeur d'Alene and features creative natural looking jagged-edged bunkers that are so appealing to the eye you feel guilty playing out of them. It's OK though, the mandatory forecaddie will take care of raking the bunker and making it pretty again. Like most Fazio courses, it is difficult to point to any one hole as the "signature" of the bunch since Tom is so adamant about creating 18 signature holes rather than just one; however a couple of holes are worth special note. 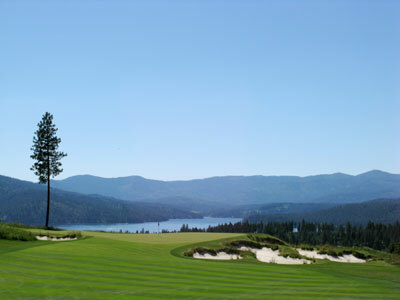 The first dramatic hole at Gozzer is the par three 3rd hole that plays well downhill to a green recessed in amongst a surrounding of natural basalt rock and features a stunning view of Lake Coeur d'Alene off to the left. The 12th hole is a fantastic driveable par four that features a split fairway. By playing to the narrower fairway on the right you have the opportunity to catch the down slope of the fairway and chase one onto the green. If you choose to play on the left side of the split fairway you will find yourself in a landing area that will require navigating extra bunkers in order to find the green. The fairway of this attractive hole is split in the middle by a large tree, basalt rock outcroppings, and a large bunker surrounded by British Open type grass. No matter which direction you choose, avoid the middle at all costs. 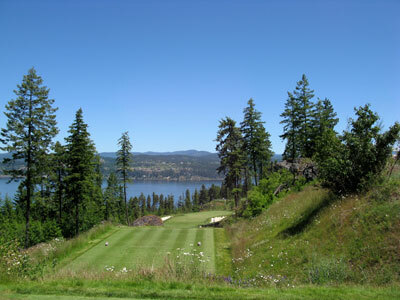 The final hole of note is the par four 15th that features captivating views of Lake Coeur d'Alene from the green site. Four time PGA Tour winner Andrew Magee works with Discovery Land and features a view of this green as his backdrop when being featured on The Golf Channel's "The Approach" weekly TV show. The golf course features stunning views, top notch conditioning and first class service and should open to rave reviews and accolades. There is one additional feature worth noting at all Discovery Land golf courses. One of their signature services is to feature two "comfort" stations midway through each nine holes as well as a grilling station where a chef prepares hot, fresh snacks for the patrons to enjoy. The comfort stations not only offer restroom facilities but also feature a separate room stocked full of goodies. You can find everything from jerky to beverages to hard boiled eggs to candy. But at Gozzer's 50s themed comfort stations you get a special bonus of soft serve ice cream and root beer being on tap so that you can create your own root beer float to enjoy during the round. At Gozzer Ranch it isn't just a fantastic golf course, it's an experience! Both courses are very exclusive so you'll need to start networking to get on these fabulous tracks, but they are well worth the work if you can get on. It is a rare opportunity in our area to enjoy a course designed by golf's most well-decorated modern-day architect, so jump all over the opportunity if it comes your way. Good Luck!